A special software offer is also in place through the end of 2018. Users can upgrade from NanoScan Standard to NanoScan Professional software for a nominal charge. 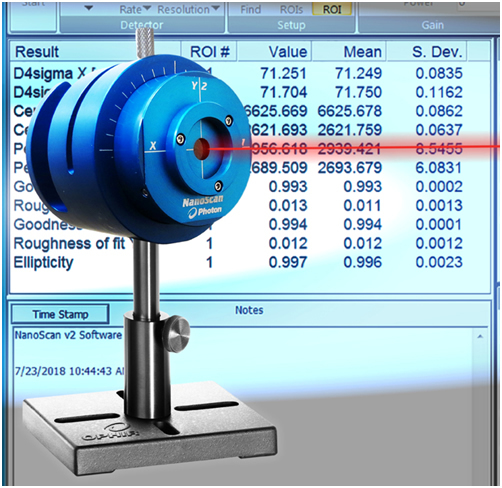 NanoScan software includes an extensive set of NIST-traceable ISO measurements for beam width and roundness, beam position, and M2. The Professional version adds an ActiveX automation interface for sharing data with other applications, such as LabVIEW® or Microsoft® Excel. "NanoScan scanning slit profilers are designed to measure smaller beams than is possible with CCD camera technology," said Reuven Silverman, General Manager at Ophir. "They are ideally suited for very small beam diameters and are often used by manufacturers of laser beam sources, such as for medical engineering. Ophir continues to invest in scanning slit technology and has expanded its offerings to include lower cost alternatives for measuring beams in the near IR to mid IR range, and to accommodate beam widths from as small as 20µm up to 6mm." 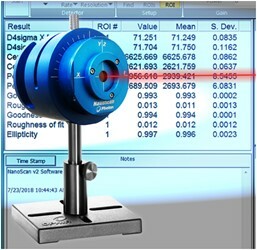 NanoScan 2s profilers use moving slits – an ISO standard scanning aperture technique – to measure beam sizes from µm to mm at beam powers from µW to kW. The natural attenuation provided by the slit allows the measurement of many beams with little or no additional attenuation required. A built-in digital controller provides 16-bit digitization of the signal for high dynamic range up to 35dB power; this makes it possible to measure beam size and beam pointing with 3-sigma precision to several hundred nanometers. The silicon or germanium detector-based NanoScan 2s's include an integrated 200mW power meter that displays both total power and individual power in each of the beams being measured. The NanoScan 2s beam profilers are available now. Ophir is a brand within the MKS Instruments Light & Motion division. The Ophir product portfolio consists of laser and LED measurement products, including laser power and energy meters, laser beam profilers measuring femto-watt to hundred-kilowatt lasers, high-performance IR and visible optical elements, IR thermal imaging lenses and zoom lenses for defense and commercial applications, OEM and replacement high-quality optics and sub-assemblies for CO2 and high-power fiber laser material processing applications. Ophir products enhance our customers’ capabilities and productivity in the semiconductor, industrial technologies, life and health sciences, research and defense markets. For more information, visit http://www.ophiropt.com/.